We are currently in the process of moving the EDU to another hosting service. Bear with us, please. I’m attempting to convert our posts to the new board software, and if it works, no one will lose posts. You may have to reupload your avatars and such. And any files you attached to posts won’t be there, but the text itself will be. So give us time to repair the hideous damage done by foreign conspirators. Ok, I’ve gotten several phone calls and questions about the EDU. No, we’re not gone completely. But a Russian hacker group used a crossite exploit to wipe out the board software. The database where all our posts are stored is safe, but the board itself is gone. To make matters much worse, the hackers then used the site to send gobs and gobs of spam. The hosting company got complaints and locked the account. So we’re looking at a wiped out board, with no way to fix it. We are trying to get back online, believe me, but it may take another week or so. Be patient, we’ll be back, and better than before. 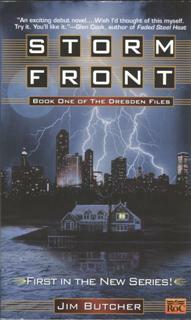 Storm Front is the first book in the Dresden Files series. Now, if you’re a big SciFi Channel fan, then you’ve probably already seen the new series “The Dresden Files”. But I’ve actually had this book for years. I read it not too long after it was published back in 2000, and loved it. But typical of me, I forgot all about the series. I’ve often had that problem. I have many first and second books of series that I just simply forgot about, and never found them again. Luckily for me, not long after I saw the promos for the new SciFi channel series, I was looking through my shelves for an old book to re-read, and found Storm Front. I went, “Dresden Files? Isn’t that the new series I’ve been hearing about? I didn’t know I had the book!” What a surprise! A quick look on Amazon.com for Jim Butcher (the author) found not one, but eight novels. I’ve recently bought books 2 and 3, but I wanted to point out book 1 especially. As the first book, it sets the tone for the series. A cross between the hard-boiled detective novels of yesteryear, and modern fantasy novels. The main character, Harry Dresden, is cynical, careworn, and sarcastic as only a hardbitten (and hungry) detective can be. He just also happens to be a powerful wizard. Unfortunately, “powerful” isn’t usually enough to keep from getting the crap beat out him. What I enjoy most about the first three books I’ve read, is that Dresden, while he is a powerful wizard, uses magic as only a tool. Every mystery he’s solved, was solved by using his most powerful tool: his brain. Sure, it’s usually AFTER he’s gotten beat upon, but still, he figures out what’s going on in the end. If you like modern horror/fantasy, pick up this series. You won’t be disappointed. A note on the SciFi channel series. While it has a lot of the same characters, its tone is completely different. Harry Dresden in the TV series just doesn’t have the same “feel”. I prefer the books. I like the TV series, but the books are better. Big surprise, huh? Let me just say one thing right off the bat. I don’t care for politics. I don’t care for most politicians. Even so, I’ve decided to rant about politics. Why? Why not? It’s my blog. You don’t like what I rant about, tough cookies! Well, with that said, off we go to la-la land. You may think otherwise, but it’s my opinion that a majority of politicians–especially the politically elite–not only have no clue what an “average” person wants and needs, but doesn’t care. It’s their job to make laws. A job that at the upper levels gives them a huge salary, and unreal benefits. In the case of U.S. senators and representatives, they even get to set their own salaries! Wow. Here, let me bold that. That’s right. Contrary to what politicians these days tell you, we don’t actually NEED them, they need US. It’s quite possible for us to go on with our lives without politicians. What? You think we do? Well, let’s take a look. We need a politician to adjudicate disputes? No, they don’t do that. We hire and elect judges for that. We need politicians to run the day-to-day business of government? No, a bureaucracy is a beautiful thing. Most day-to-day operations are run by secretaries and assistants, who normally know much more about what’s going on than the politician. We need a politician to make laws, their main job? No, we have plenty of laws on the books right now. We could definitely do WITHOUT new laws for a couple of years or more. We need politicians to tell us what to do? Is that what you REALLY think? That these people have the knowledge and wisdom to tell you how to live your life? Please, you’re much more intelligent than that. These people don’t know jack. I say we get rid of them. Ok, this really is something else. Two things. One, the Boston Bomb Scare. Read the story if you haven’t heard about this. Apparently, someone in Boston noticed a strange device hanging from an overpass, and called police. The police decided to go into overdrive, called in the bomb squad, and had the device blown up. Several other similar devices were found across the city. They were disposed of, or removed. It was determined by “experts”, that the devices were a hoax. What were they in fact? Advertisements for the Cartoon Network show “Aqua Teen Hunger Force”. In fact, they were freakin’ LITE BRITES. That’s right. Gajillions of dollars (ok, maybe not, but a lot of money) were spent getting these things down, with streets shut down, and people evacuated, and they were light boards like the one my cousin had 20 YEARS AGO! My God, Boston! Even better, they’d been there for WEEKS before anyone noticed! And to top it all off, the devices were in several other major cities, and no one cared! Can someone say, “overreaction”? I knew you could. Second, though, is the fact that the above article and this one (http://news.xinhuanet.com/english/2007-02/06/content_5704846.htm) are from Japan and China respectively. The ones I’ve found from the U.S. major news sources seem to be concentrating on the so-called “hoax perpetrators”. The two men who were scapegoated into jail. The overseas articles seem to be much more neutral, letting the reader judge how idiotic one American city can be.